Between flood damage and the inconvenience of moving dust-collecting plastic instruments to a new home on short notice, every piece of Rock Band or Guitar Hero equipment I once owned has been trashed, save one. Oh yeah, Baby and I are ready for Rock Band 4. Thursday's announcement of Rock Band 4 for the Xbox One and PlayStation 4 came with good news and bad news. The bad news was that keyboard, my favorite addition to the series, would not be supported in the new game. The good news? Harmonix and Mad Catz plan on making all older non-keyboard hardware compatible with the new game. 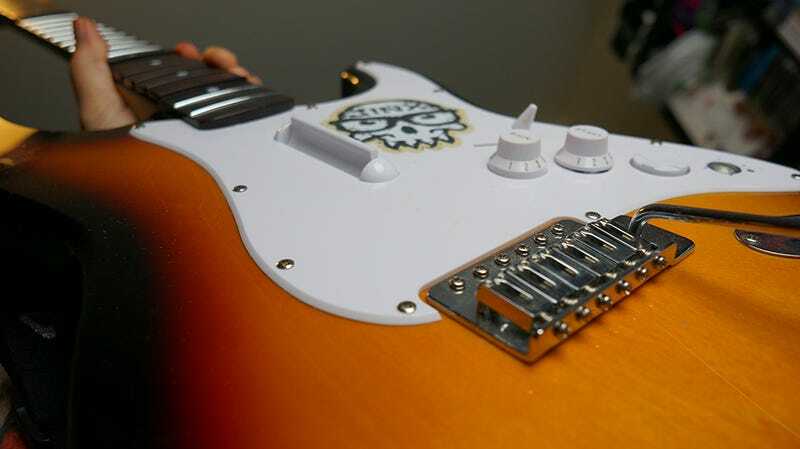 More than half a decade ago (time flies) I had the chance to review Mad Catz' Wireless Wooden Fender Stratocaster for Rock Band, and since then no plastic guitar has felt right in my hands. After my review I purchased my own, and I've not played Rock Band without it since. I call her Baby, though she's more of a toddler at this point. The years have taken their toll—she's got scratches and bangs all over her body. At some point she got a sticker affixed to her face. And her buttons—her poor buttons, with their worn faces. Since Thursday's announcement, Baby and I have been getting to know each other again. She's still impressively weighty. Her strum bar clicks delightfully. Her buttons dance beneath my fingers. I've owned real guitars in the past, but I haven't loved them as much. I guess I'll eventually need a microphone for my wife to sing along, and maybe I can teach my children to rock the drums or bass. But for now, Baby and I have each other, and that's enough for love. We'll give it a shot. Are you folks ready for Rock Band 4? Do you have a coveted instrument you've been saving for this day? How many plastic instruments have you trashed in the years since Rock Band 3? Let us remember the good old days while looking forward to a new age of clicking to the music.